“Dumb & Dumber” is not even close to being a cinematic classic. It is, however, a terrifically funny silly comedy. And a lot of people love it, including me. It’s also undeniably dumb. The thing is though; it’s not a poorly made film. It’s simple, but it’s not simple-minded. It’s raunchy and juvenile, but you can feel that the people behind it knew what they were doing. You’ll hear it time and time again in Hollywood, comedy is really hard to do but it’s probably the least respected. Why that is I’ll never really know. “Dumb & Dumber” was special, probably because it hit right at the right time, and because it was one of several movies released that year that introduced the world to the brilliant, comedic talents of Jim Carrey. For anyone who fell in love with the comedy duo of Lloyd (Carrey) and Harry (Jeff Daniels) seeing them reprise their roles twenty years later is a proposition almost impossible to resist. The problem however is that seeing old Jim Carrey and old Jeff Daniels repeat the same goofy, slapstick humor is just sad and depressing, and surprisingly unfunny. Yes it’s true; “Dumb & Dumber To” is a complete disaster from beginning to end. There’s nary a standout funny moment in its nearly two hour runtime. That’s just sad since the first film functioned on an “Airplane!” let’s see how many of these jokes and gags stick level. It’s twenty years later and I still find myself quoting lines from the film in everyday conversation. No one will be quoting the sequel, even months from now. Bobby and Peter Farrelly who branded this type of silly goofy comedy back in the 90s (and for the record, haven’t made a good movie since 2005’s “Fever Pitch”) seem oddly distant from the material this time around. It really shows: the film feels sloppy, hastily put together, and has no real comic timing or rhythm, and it goes on seemingly forever. Something is just off. Perhaps it’s the six writers’ “attempt” to come up with any kind of story for these two characters that could possibly sustain another full length film. The end result is a terrible SNL sketch drawn out to feature length. The plot is promising enough: Harry needs a kidney, and also finds out his has a long-lost biological daughter. And the pair head out to find her in hopes she’ll donate her kidney. It’s a good idea to get these guys out on the road – a premise that worked extremely well in the first film – but the movie has way too many bumps along the road. The first film featured a serious kidnapping plot with an interesting MacGuffin that was the perfect counterbalance to the goofy goings on with Harry and Lloyd who stumble upon it. Here it’s too forced and feels almost too convoluted and overly complicated. And worst of all, you never care about this story or how it’s going to turn out. And it wastes the talent of the actors involved. Expect for the terrible actress - who I won’t even name - who plays Harry’s grown up daughter who has no actual talent Her performance is just awful and it’s a major insult to all other actresses who could have played the part. There were exactly two jokes that I found even remotely funny. One involves Harry and Lloyd ending up at the wrong address and another involves a throwaway reference to Asperger’s. That’s all. There is too much of an emphasis on silly sight gags with no payoff. How about, a meth cook as a roommate. Ok. The cat licks the crystal meth. Ok, where is this going. Then the cat… hangs from the chandelier. That’s all? Let’s not even mention the poorly throughout “mistaken identity” plot that takes over the film’s final act. Only two things in the entire movie that’s funny? Not worth the time or effort. 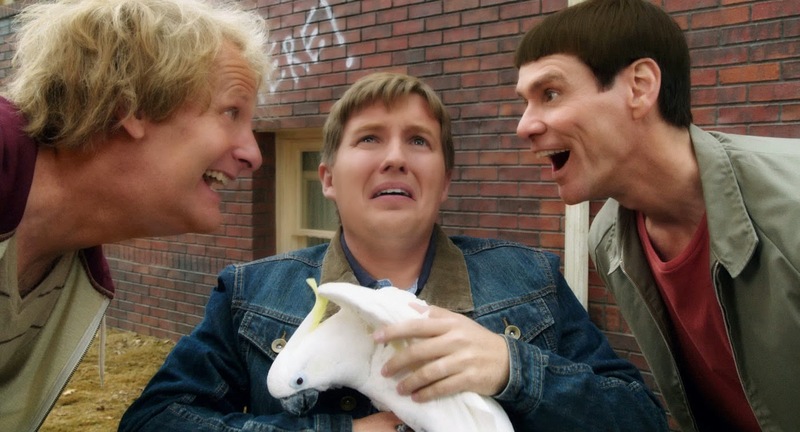 Trailer for Dumb and Dumber To on TrailerAddict.